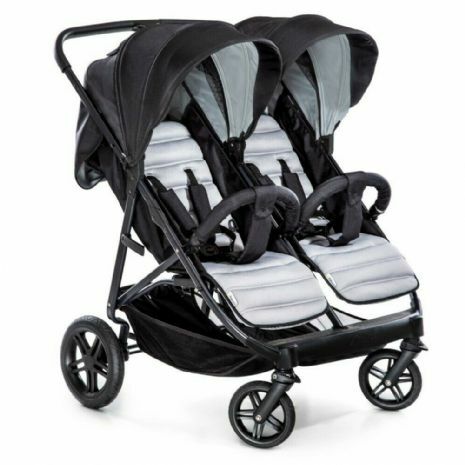 Rapid 3R Duo is a high-quality sibling stroller usable right from birth! Agile with all-terrain wheels, elegant fabrics and compact folding, you can use Rapid 3R Duo in combination with two baby car seats (available separately) thanks to the car seat adapters which are included. The Rapid 3R Duo fits through any door thanks to its width of only 77 cm. The softly padded seats are simply comfortable. The two backrests are individually adjustable in lying position by pulling the strap. The footrest are individually adjustable, too. And to pull forward the large canopies, you simply need to open the zip fastenings to make emerge the mesh area which also guarantees optimum ventilation. At the same time, you can always see your children. And the most important: their safety is always guaranteed thanks to the 5-point belt systems and the padded front bumpers. In order to easily transportation you can fold the Rapid 3R Duo down compactly with one hand only. © Copyright ALICEKIDDIWORLD All rights reserved.